This morning's weather graphic from the National Weather Service office in the Twin Cities identified several upcoming snow possibilities. What surprised us, however, was the mention of specific inch totals (possibilities) for a storm that's five days away. And, in case you missed it, this was an interesting graphic reflecting how the Twin Cities narrowly two different snowstorms in the last several days. Here's what the NWS posted at 7:29 p.m. on Wednesday evening. Kare 11 is calling for rain this Friday (possibly mixed with a little snow). The NWS is calling for a widespread snowfall of 2-4 inches. Talk about night and day differences in the forecasts. Wow, when I look at the graphic for the last two snowstorms I am almost incredulous. Talk about the Metro being in the center of a 1-2 snowstorm punch sandwich. As a snow fan that saddens me. The NWS has slightly modified the top graphic, for the right graphic to say "several more inches of snow possible" vs. the 3-8 listed. So basically they are have become even more vague. And they should be vague...it's still almost a week away! Agreed! A week is an eternity in the weather forecasting business. I like when the National Weather Service (or anyone) gives us some indication that there is big storm potential. It is something to look forward to and get pumped about. With pumping potential also comes bummed potential. But I will take that risk! Bring it! Weather Nation just said that there is the potential for 12-13 inches of snow across the Metro next Monday/Tuesday. We will see how that does or does not change over the course of this next week. "12-13 inches"? What an odd amount to throw out. Bill, they used a future snowfall forecast simulation. When they moved the cursor over the Metro it displayed 12-13 inches possible for the Metro. The amounts ranged from like 3.9 inches at International Falls to 12-13 inches for the Metro and 11 inches for far southern and southwestern MN. Ah, sounds like the dreaded "snow meter" or variation thereof. Thanks. AND END INTO FRIDAY EVENING. Okaaaaay, so what happened to that snowy Friday? It looks like the snow forecast turned to rain in less than a span of 10 hours. Totally agree with you Anonymous,was going to post something like the post you have above,the NWS is already doing their tap-dancing,I've lost a bunch of credibility with them this winter,a lot of mistakes and early predictions like the one this morning,moving headlines and incorrect positions of headlines,yes weather is a moving target,but isn't the NWS suppose to be the best of the best,next Monday is light years away and may not even touch us.There will always be "potential" in the weather business,but its how you present it is what sticks in the public mind.Case in point the 2-5 inches with 3 clippers this week,already going south,todays clipper dropped 0 so already their behind and their introducing rain for Friday,so how can you even trust what they say for next Monday when they can't even get the short term correct!Frustating! Anonymous @ 4:54 pm and Sam G., you guys beat me to it. I've been at work and haven't had a chance to essentially write what the two of you have written. Frustrating doesn't even begin to describe the situation. The NWS is typically pretty accurate, but for some reason they have been having a difficult time of it the past few months. I echo the caution for us snow lovers to be very very cautiously optimistic about the storm next week. I think someone from Accuweather stole the key to the NWS office and monkeyed with the forecasts. Since when does the NWS show a graphic suggesting 3-8 inches of snow for so many days out. LOL,Bill. Speaking of Accuweather they do have 7 inches of snow for us Sunday night into Monday,for what its worth! Looking at the Teleconnection indices from the 3/12/12z model suites. I see us setting up into a very active period. Staring with the EPO, it is slightly negative which should put us in weak NW flow, allowing some cold air to come in from NW Canada. We have a very strong west based NAO which will allow for blocking to set over Greenland if not slightly west of there into the Hudson Bay area. The PNA is forecast to stay negative through at least the 24th if not the end of the month. While at the same time the AO is strongly negative at this time and is forecast to stay that way. While at the same time some global models are trying to build a H5 ridge over the SE US. This all means, at least to me, that the baroclinic zone will set up over the north central plains providing us with the active pattern mentioned above. Looking into April, keeping in mind the Teleconnection's that I pointed out in my previous post. I see strong hints that April will be colder than normal, and maybe much colder. There are some strong hints that we could see a stratospheric warming event for the polar regions, whether that would be a sudden stratospheric warming event or a gradual one is yet to be determined. This is a animation of the 10mb temps over the far north, look how the warm temps are now spreading towards the Gulf of Alaska. Could they get to the polar region? I think so. and notice how the temps are starting to respond over the pole. So What does that mean for April? I believe it means much below temps as cold air could be released into the northern US. Here is what the CFSv2 is showing for April, first by week, than by month. lets start from March 18th to the 26th. And now from the 26th of March to April 8th. Now lets take a look at what it shows for the entire month of April. Keep in mind that IC means that the April forecast is based on Initial conditions as of that date, you can clearly see the cold bias that is setting up. And the Twins open up on April 1st at home??? Hmmm. For those of you that read my last post in the previous thread about how there was a weakness over Canada north of Green Bay and the Sun/Mon storm could move further west over Chicago. Well the latest run of the GFS (13/0z) has the surface low passing west of Chicago and moving over the Green Bay area. I'm sure it won't hold that exact track as the days go by, but I believe the GFS is close to the right solution. The Euro and GEM are both kind of getting there, this is looking more and more interesting, but it is still 5 days out, lets wait 2 more days and see how things are setting up then. Thanks for all the good info Randyinchamplin,a delayed spring would totally be okay with me after the heat we experienced last March,the later spring gets here thats one less day of warm temperatures. BTW,@Bill have you seen the new updated weather story page from the NWS?,next 2 clippers are now 1-3,not 2-5 and the Sun/Mon is now a 'possibility' as they also explain the uncertainity with the conflicting weather models,they should have just went with that yesterday then the 3-8" story. Good stuff, Duane! Thanks for the presentation. Nice job Duane!!! BTW what was your initial guess for seasonal snowfall? If I remember right I thought it was around 55" or so. Good job, Duane! It's nice to get up to the minute information. Thanks guys! I appreciate it. Randy I think my initial guess was around 50 for MSP so I may have ended up under doing it. Remember when people thought that we wouldn't even surpass last years snow totals? Anyway, the way the models continue to look, I'm going to end up being way under for the totals for this season. That late weekend system continues to look impressive. Remember the dome buster storm in 2010? Remember the December storm from this winter? There are a lot of similarities in the evolution of the low, the track of the low, and the amount of moisture coming into this system. GEM, GFS, Euro, and FIM all have this system on somewhat similar tracks. I'm not really getting too excited about it because we still have several days of model runs left and we've been led astray before by these pesky models but seeing a consistent signal of a strong system, and the history of these hybrid clippers putting down a lot of snow has me optimistic. To echo what some others have said, it's still way too early, in my opinion, to be throwing snow total potential this early in the game. If all the 12z models come in like the GFS has, then the NWS may be changing their tone for those numbers. Significant accumulations possible should be more of the wording. Again it's early, but it is certainly worth watching! Dumb question, how will it snow on friday with temps in mid-upper 30's? I am guessing it wont be able to stick? 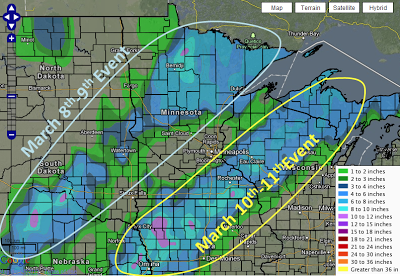 What a beautiful snow set-up here in the month of March for much of the Upper Midwest. Take a look at the temperature anomalies for the northern Hemisphere. Significant warming at the North Pole and Arctic Ocean have suppressed the bitter cold Arctic air much further south than usual. In turn, this cold has seeped into much of southern Canada & the northern U.S. and is just sitting there because it has no place to go. Meanwhile, the sun is still doing what it is suppose to do this time of the year and is warming the the southern U.S. and points south. All of this has set-up an unusually strong Jet Stream and temperature contrast across North America. Because of this, we will see an amazingly active weather pattern for the next couple of weeks that features warm Gulf moisture overriding cold Arctic air over the northern U.S. Perfect recipe for Winter Storms. Did something change with these next 2 clippers?.....did they get more organized/stronger or a more favorable track,because the NWS in their evening discussion has now 1-2 for tommorrow morning and 2-5 inches for Friday,so in total were suppose to get 3-7 inches the next two days? Look again Big Daddy,NWS has updated their weather story graphic,if you live within the metro core NWS says expect 4-9 between the 2 clipper systems. Also their calling for heavy snow with blizzard conditions and over 6 inches for late Sunday/Monday. What a snow blitz shaping up if these all pan out! Looks like the GFS is the winner with the clippers, especially the second one. For amateur and pro forecasters alike, we may have a new superior winter weather model. When Environmental Canada announced the upgrade to the Gem model a few weeks ago, they said they had been running a parallel model with the new upgrade as opposed to the old gem. The conclusion was startling. During the winter season they said that the improvement of the parallel run was so drastic, that such improvements are normally seen once a decade. So they implemented the upgrade. Remember the last system that dumped heavy snows on SE MN? The Gem had it early and often, the rest of the global models including the King Euro were all over the place. Now fast forward to this weekends system. The 13/0z run of the Gem had the surface track of the low moving over central MN, the GFS and the Euro had it further south. When the 13/12z runs came in the GFS still had it south, but the Euro moved towards the GEM. At 13/18z the GFS moved towards the Gem solution as well. The track of this system will wobble from day to day until we get to say Saturday morning, it will be interesting to see how it develops. But those forecasters that ignore the Gem may be making a big mistake. at 96 hrs there is not much change. but here is the total snowfall through 120 hrs and it's not done yet. Keep in mind I did not load these maps into a photo sharing site, they may change as you click onto the links. Not sure where the 4-9" for the next two clippers from the NWS is coming from, and maybe I am looking in a different spot. The latest I saw was 3-6" north of I94, which makes a lot more sense. I actually expect very little from tomorrow's clipper, and warm temperatures will melt any new snow during the afternoon. Friday looks like mostly rain in the metro, with a little snow possible as temperatures drop during the afternoon. As of snow I think MSP would be lucky to see more than 2" total from both clippers. Monday is still the storm to watch and could be a lot of fun. Cold air will definitely not be a problem with this system. Randy, not sure where that 4-9 is coming from either, the best that I can see is 2-4" over the core metro with both clippers, I think the person that posted that looked at the weather story and misinterpreted it. Randy Hill and randyinchamplin. I just looked at the NWS graphic and it shows 1-3 inches for tomorrow morning and 3-6 inches for tomorrow night/Friday. Anonymous where do live? which city? I will try and pull up the NWS graph for snowfall amounts for that city or zip code. Zip code will be best. randyinchamplin, my zip code is 55337 (Burnsville). Ok I see that, I feel that the higher end snow fall totals will be bust. I would go with the lower amounts based on the written forecast, there has some disco's about how the graphical forecast may not match the written forecast, it does seem to be a problem with NOAA, I don't know if it will get fixed any time soon, if your on facebook, which I am not,you may want to have them explain the differences between the written forecast and graphical. Thanks, randyinchamplin. I put more faith in you, Novak, Randy Hill and Duane than I do in the NWS anymore! Thank you for the vote of confidence, but please, and I'm serious about this, don't ever discount the NWS, even though we have a lot of toys that we relay on, the NWS has two to three times more. They are the best in world bar none. I will say this however, take the local media forecast 2-3 days out with a grain of salt, as I listen to a radio or watch a weather forecast I can almost always tell you what model they are buying into, and most often times it's the US models. I generally put more trust 2-3 days out in the consensus foreign models like the Euro,GEM,UKMET, and the shorter term 48hr RGEM. Man,I sense that the NWS isnt getting much love lately! Well they haven't been too good lately... and have seemed uncharacteristically aggressive. 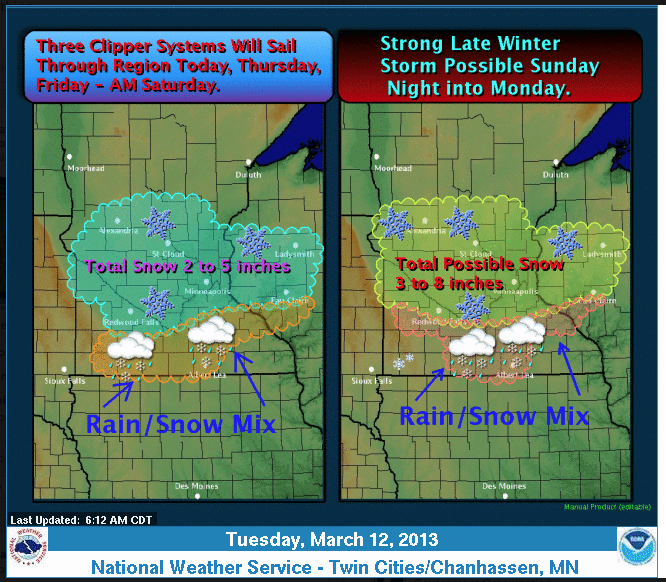 @Randyinchamplin if I follow what is written in their discussion,the totals are 1-2 and 2-5,thats 3-7 inches between the 2 clippers according to the NWS,if I follow the graphical weather story then we fall into the 1-3 and 3-6 band,which is 4-9 inches....I'm just doing the simple math with the numbers they are providing,I'm not making these up nor do I think I misinterperted it. Just keep in mind...most of us do this for a hobby but the NWS does this for a job. They have the schooling, and they have the full understanding of the dynamics at play and whether or not models are underdoing or overdoing something. Yeah, we'll get it right from time to time but don't lose any faith in the boys and girls at Chanhassen and La Crosse. We have the luxury of only really having to deal with some of the occasional haters in here if we are incorrect. They don't have that same luxury. Certainly appreciate the compliments though but seriously I'm very "green" when it comes to forecasting so I just throw out a best guess. So...best guesses will be coming at you just like they have in the past. 00z NAM data is in, and has trended more towards the other models with the first two clippers. First one still looks light, second one still looks a bit stronger than the first. The larger storm is still too far out for the NAM to pick up, but the GFS will be coming in soon, with the GEM and Euro to follow close behind. A peek at the NAM snow totals for the first two clippers combined. WCCO's Shaffer used the word "model" a million times in his forecast. Even said, "if the models pull this south, than yetta yetta yetta." Can he at least say, "if the storm goes south..." It's like models have become a sort of virtual reality for him. TV mets should be prohibited from uttering the word "models." I just added a picture of what the NWS posted this evening on its Facebook page (third picture). Looking at the depiction conservatively, it seems they are calling for at least 4 inches with the first two snow events. Been snowing for about an hour(4am),here in Eden Prairie....about 1/2 inch so far....heavy band over east metro towards WI border/Hudson area. One-half inch in Rosemount. The snow has ended. Just about an inch here in Golden Valley.........I'm sure there will be reports from Anoka county and east metro of 2-4 inches,I was watching on radar about 5am and the heaviest band set-up over those areas,but all in all a nuisance snowfall which I think the NWS forecasted properly when they said 1-3 inches(some got 1 and others 2-3).Let's see how they do with tommorrows clipper,they still have 3-6 in their weather story and said 2-4 in their cwa discussion this morning,we'll see! Almost an inch in St. Paul. Just a dusting here in Burnsville, maybe a half an inch at most. I saw that the NWS posted 4.5 inches in Gillman (Benton County). I have a strong feeling that tonight's clipper and the storm on Monday are also going to favor central MN (St. Cloud area) and north. I live in the TC metro so I hope I am wrong, but from what I am reading the indications are that if you really want snow, then "Go North"! Anonymous @ 9:26 a.m., unfortunately, I am starting to share those same feelings. It seems that over the past couple of days all of the systems have shifted north and thus have taken (or appear they will take) the heaviest snow north of the TC Metro. This morning's clipper dropped much more snow in central MN than in the TC Metro. I see that tonight's clipper is now supposed to drop 4-6+ from central MN to Duluth. Yesterday the NWS had 3-6 inches posted for the TC Metro. Novak posted an hour ago on FB that the TC Metro is going to be more in line for 1-2 inches from tonight's clipper. Finally, the NWS graphic this morning shows the Monday storm going north of the TC Metro instead of across far southern MN/northern Iowa. The national weather service should really get its forecast discussion and graphics in synch with each other. The discussion this morning talks about snow in the Metro for Sunday night/Monday, while this morning's graphics show the storm traveling from southwest MN northeast across approximately Anoka County, which would mean rain and/or mix for the TC. Last night's graphic showed the storm traveling almost due west to east along extreme southern MN. I'm no expert, so perhaps I am missing something? Mondays snowstorm is going north of the metro?and taking the heavy snow with it. For a couple of days now the track was just south of us and even tracking along the Iowa border,now the NWS has it going just north of the metro,which means metro gets very little snow,all this hype about blah blah snow and delayed spring and the cold is going to stick around and create all kinds of winter storms for the northern states,when it comes right down to it the weather in the metro is pretty tame.Just look at this past weekends snowy doughnut for the metro,then Tuesday zero inches from a clipper,then today only. One inch,tommorrow was suppose to be snowy in the metro but mixed/rain looks to be taking over and then Monday with the system now going north,so you see all this talk about winter not giving up its grip on us,but in reality the weather has been lame,yes the temps are running below normal but nothing we Minnesotan's can't handle! These last two anonymous posts are pretty similar. I think someone woke up on the wrong side of the bed. They must not have looked at the temperature profile for Sunday night and Monday. It will be cold enough for all snow regardless of the track of the Low, so there cranky pants. Glad to hear the site has been so useful for you, MNPLOWCO! If I figure out a way to make the site more sophisticated, I'll put out the donation tray. In the meantime, enjoy! I guess Randyinchamplin is corect,follow the GEM he says and now the other models are following bringing Mondays storm further north,tracking north of the metro,as others here have a alluded to that's not a favorable track for the heaviest snows to fall on the metro.Good job Randyinchamplin,let's just hope it doesn't go any further north and we got pretty much nothing. TWC went from 70% snow on Monday to 50% "snow showers". Must be picking up on that trend north as well. Here we reccived (and extraordinarily surpried to) four inches of snow! Perhaps we ended up in a bubble of heavy snow here or somthing, but I know this for a fact. Where are you located, bemaki? Wow, congrats! Here in Lakeville we picked up about half an inch. Blaine got 2.5 inches, according to the weather service. Batten down the hatches northern Minnesota! I guess we can't be too surprised. It's mid-March. With few exceptions, snowstorms this time of year typically favor primarily northern Minnesota. I would be really upset with the northern trend of the storm if this was November-February. I love winter and snow as much as anyone on this site, but let's face it, it's time to set our sights on Spring with warm weather, green grass and baseball! We will all look forward to next winter and hope it is a cold and very snowy one. In the meantime, my thinking for snow on Friday. It looks like it will come in two waves (probably perfect timing for morning and evening rush hour). 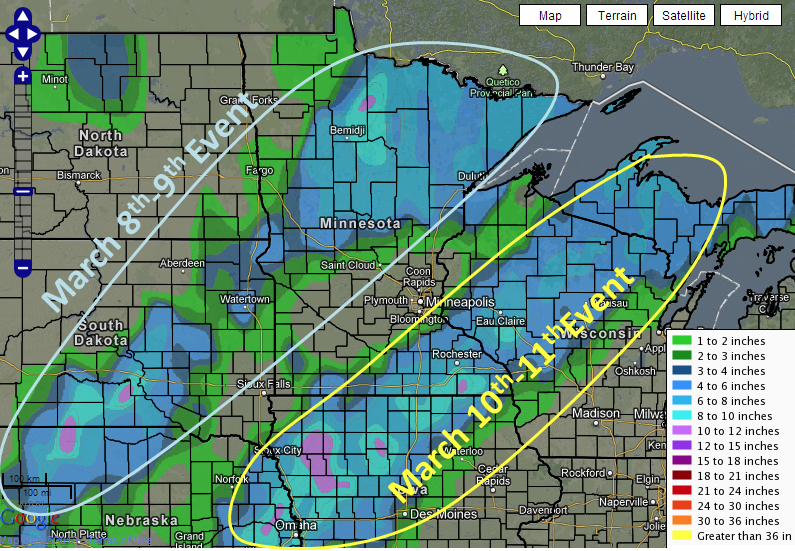 I would say 2-4 inches of snow are possible, with possible higher amounts especially in far NW MN and into western WI. A winter weather advisory will likely be needed in the area highlighted in the image. Again, this is just my initial, uneducated guess. Not exactly sure if they would consider a more widespread advisory for the mixing potential south of this band, but it wouldn't really surprise me if they did. It will be interesting to see if that very narrow band of 6+ ends up verifying. No surprise here. Time will tell, of course. Thanks for the update, Duane. The Sunday/Monday system is still very challenging for the forecasters, the 14/12z runs of the Euro and GFS have followed what the GEM had shown with the low tracking to the north of us. The 14/12z of the gem is completely different, it reverts back to what the models where showing a couple days ago. It brings a 1000mb low into central SD that is fairly compact, while at the same time it develops a wide 1000mb low over northern TX northward into western KS and eastern CO Sunday evening. After which the SD surface low gets absorbed into the southern stream, bringing a negative tilted inverted surface trough through our area with nice snows. AS Duane eluded to with one his earlier posts, half the fun of watching these systems is how the models depict it and which one may be right. Lets see if tonight's run of the models favor the Gem or the GFS/Euro. BTW if the Eruo/GFS is right, it's shouting dry slot over MSP. Paul Huttner over at MPR has a real good right up on the improvements of the GEM in his latest blog, as he states it will take a couple a couple months to sort things out. I have developed a love/hate relationship with Daylight Savings Time, I love the extra hour of daylight in the evening, but it means the models come in 1 hour later. Hope to make it a bit more professional looking in the future. AWESOME!!! I hope you guys can do this during severe weather season as well, so much more info than what TV can show!! If you do I hope you fully explain what a slight and moderate means. I get sick and tired of our local mets telling us that the SPC has put into a moderate risk of severe weather without explaining what it means.